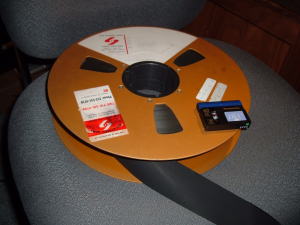 Over the years, NASA had removed massive numbers of magnetic tapes from the shelves. In the early 1980s alone, tens of thousands of boxes were withdrawn. It turns out that new satellites had gone up and were producing a lot of data that needed to be recorded. “These satellites were suddenly using tapes seven days a week, 24 hours a day,” says Lebar. And the agency was experiencing a critical shortage of magnetic tapes. So NASA started erasing old ones and reusing them. That’s probably what happened to the original footage from the moon that the astronauts captured with their lunar camera, says Lebar. It was stored on telemetry tapes, and old tapes with telemetry data were being recycled. The article also explains how the specially-designed video cameras that astronauts took the moon produced videos of much higher quality than the snowy, blurry video American households saw that night, and we’ve seen for many years since. Regrettably, the Apollo video cameras used a non-standard format, requiring machinations on the ground to both store the content and convert it to more conventional means (and thus, introducing the noise and blur on currently available tapes). And so, NASA becomes a poster child not only for the pitfalls of poor preservation planning, but the perils of using non-standard, proprietary formats to record important, historic moments! For two years, owners of Apple’s iPhone have complained bitterly about the lack of video recording capability, something that has become more and more common on mobile devices, if not yet matured. Three weeks ago, they finally got their wish, and the results have been quite dramatic. The weekend after Apple’s latest reveal – the iPhone 3GS – was released to the public, YouTube reported a massive 400% surge in the number of mobile video uploads, attesting to the mass appeal of Apple’s product and opening the floodgates for new video content. Admittedly, seeing the sudden unleashing of newly-minted cellphone videographers made me cringe a bit, at first. For a while now, I’ve been kind of annoyed with the popularity of cell phone video. Let’s face it, although lots of people want something small and compact to make quick videos with, the image and sound quality coming from these devices has been utterly deplorable. 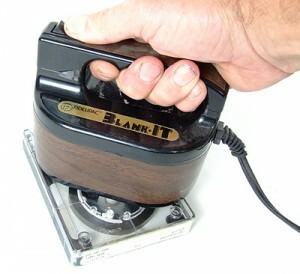 Blocky video, muddy sound… in general, not something you really want to store cherished memories with. But what really stuck in my craw was when news sources started relying on cellphone videography as poor substitutes for actual newsgathering. I began to ask myself: When did yanking video off a YouTube account start to pass as acceptable broadcast-quality content? Within the past couple of months, however, things have changed quite a bit. It actually started when camera makers like Canon began including video capabilities into their Digital SLR cameras, such as the Canon T1i. Although it looks nothing like a camcorder, this model actually records some incredibly good HD-quality video, and can store it on a postage-stamp sized SD card. It’s still rather bulky and expensive though; not the kind of thing an average person on the street would carry with them at all times. Apple, however, changed that. They finally decided to include video capabilities on their latest device. And, they did the job so well that some aspiring independent film makers are now shooting films solely with the iPhone. While the critical acclaim of the subject matter is best left open to judgement, one can’t deny the video quality is astoundingly good, compared to what everyone is used to from a cellphone. The ramifications are clearly huge. There’s been lots of talk about how accessible good video recording technology has become, but now the technology to have a high quality video recorder literally in your pocket is available to the masses. The technical specs of the videos created aren’t lightweight by any means, either. 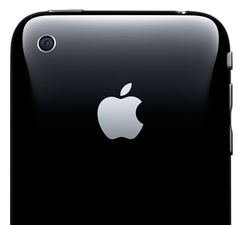 Some users have reported that an hour of video from an iPhone 3GS can take up as much as 8GB of storage. Still not on par with the roughly 20GB per hour that broadcast-level DV video consumes, but not anything to sneeze at, either. The wide availability of this level of video production is going to require lots of supporting memory and storage to back it up. And the metadata and details surrounding each and every video produced could be enough to turn the average cell phone user into amateur video catalogers, as well. For professional curators, this could be both good and bad news. From my perspective, it’s good that there’s a better chance history-making content will actually be recorded on a camera worthy of capturing it, as opposed to poor specimens of history like this. On the other hand, this means that good quality video will be coming from multitudes of sources, more than we’ve ever been accustomed to, as more and more individuals have the technology within their grasp.